Human Circulatory System Description | Your Guide to Healthy Living! The human Circulatory System is vital to keep you alive. Your heart, a major component of your Cardiovascular System continuously pumps blood though the tiny capillaries to all your organs, delivering essential nourishment, oxygen, hormones and disease fighting antibodies. In a similar way the complex network of vessels of Lymphatic System branches through all your body parts circulating lymph to maintain body fluid balance and defend against infection. Diet alone may not supply sufficient nutrients to maintain proper circulatory heath. The most effective supplements for the human Cardiovascular and the Lymphatic Systems provides the additional nutrients needed for the cellular biochemical reactions taking place within these body systems. The Circulatory System description below, helps you to understand the working of this system. This valuable information helps to you to make better supplement choices based on your specific body needs regarding blood pressure control, cardiovascular/circulatory health, heart health and lymphatic health supplements. The human Circulatory System is made up of two sub-systems. 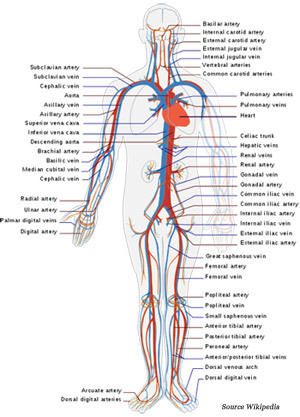 The Cardiovascular System that circulating blood; and the Lymphatic System circulating lymph throughout the body. The role, main functions and main organs of these human body systems are outlined below. The human Cardiovascular System is a series of human body organs that enables blood to circulate throughout the body to nourish and remove metabolic waste from body cells. Blood is made up of plasma, red blood cells, white blood cells and platelets. A major function of the Cardiovascular System is to deliver/transport essential nutrients to human body cells for us to function properly and stay healthy. In addition, the Cardiovascular System removes metabolic wastes. Metabolic waste is unusable substances left over from metabolic processes and include nitrogenous wastes (uric acid), sulfates, water, phosphates, etc. Another key function of the Cardiovascular System is to provide oxygen and remove carbon dioxide. The energy producing oxygen is transported by red blood cells to the entire body. The removal of excess carbon dioxide prevents Hypercapnia damaging body cells (intracellular acidosis). By definition, Hypercapnia is abnormal elevated levels of carbon dioxide (CO2) in the blood. Helps regulating and stabilizing body temperature and pH. Protecting body against diseases and infections and healing the body. Preventing blood loss by clotting that stops bleeding after injury. Transports hormones to target cells and organs. The main organ of the human Cardiovascular System is the heart. Other organs includes the arteries, veins and capillaries. The heart pumps blood through the human body and the arterial circulation delivers blood to the body cells. 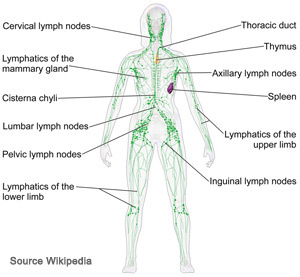 The human Lymphatic System is a series of body organs that circulates lymph throughout the body. Similarly to blood, lymph also contains a variety of body substances. By way of example, lymph contains white blood cells, fats, proteins, salts, glucose and water. The Lymphatic System is also viewed as your body’s drainage system that works closely with your Immune System. The Lymphatic System maintains human body fluid balance (homeostasis) in order to keep your body in a healthy and steady state. The system works together with the Cardiovascular System and Immune Systems to maintain homeostasis. The Lymphatic System drains out toxins, defending the body against disease, and recycling plasma proteins. Notably, the Lymphatic System deposits excess fluid (interstitial fluid) and dissolved substances collected from the body tissues in the bloodstream. Disease-fighting white blood cells (lymphocytes) are produced by the Lymphatic System to defend the human body against infection. It transports the white blood cells (not red blood cells) to and from the lymph nodes into the bones. Another important function of the Lymphatic System is to absorb and transport chyle (fatty acids and fats) from the digestive tract of the Digestive System. The Lymphatic System also coordinates the immune response of other cells to remove harmful antigen (viruses, parasites, bacteria, toxins, cellular debris and fungi) that accumulate in our bodies. The main organ of the human Lymphatic System is the Thymus Gland. Some of the other organs are lymph glands and vessels, spleen and tonsils. The most highly recommended supplements that work for the human Cardiovascular and the Lymphatic Systems are based on 1,000s of user reviews. These supplements will be continually updated. Please provide comments and submit supplement recommendations that worked for you, on blood pressure control, cardiovascular/circulatory health, heart health and lymphatic health, by completing the form below.